"Sure, they might go blind. They might fall down and stick their fingers in their eyes, or they might shoot themselves in the eye. Oh, anything is likely to happen in this vale of tears." On February 15, 1907, Dr. J.W. Hymson of 2033 Normandie St., Los Angeles, was arrested in that city on charges of frightening Mrs. Joseph Torrey and Mrs. Robert Crews into buying his eyeglasses by informing them they might go blind (the charge was actually false pretenses). The women claimed he hypnotized them into paying the exorbitant price of $110 for two pairs of spectacles. 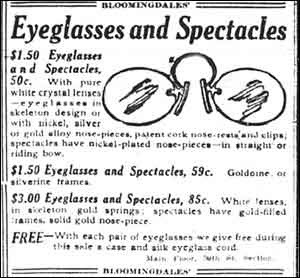 The Bloomingdale's advertisement seen below indicates that spectacles were selling for $1.50 to $3.00 in 1907, so it is evident the price was exorbitant. Hymson was described as having a high forehead, piercing black eyes and black whiskers. It was the reporter's opinion that, "it requires no great stretch of the imagination of an impressionable person (read women) to conceive him a veritable Svengali." "He hypnotized us, that's what he did,” said the excited and indignant Mrs. Torrey in Justice Brayton's Long Beach courtroom yesterday. "He came to our house and looked at my eyes and my daughter's eyes. The examination didn't take very long, and then he frightened us nearly to death by saying that within a few months both of us might go blind. He said he would examine our eyes free at home, but if we waited we would have to go to San Francisco in order to have him test our eyes." It comes as no surprise that none of the cheaper glasses fit the women. After trying on all the glasses the women were convinced to order the expensive pair. Dr. Hymson demanded immediate payment. Mrs. Torrey gave him a purchase order on the Glen Holly Dairy and he required her to telephone an endorsement. He left the Torrey farm and traveled to the ranch of Hubert Crews where much the same scenario took place. Obviously feeling remorse for the purchases, both women told their husbands of being hypnotized and their husbands told the police. Dr. Hymson professed great astonishment at being arrested, telling the judge he had not violated any law and that he repeatedly told his patients if they were not satisfied with the glasses he sold them he would refund the money. Using the "Red Ryder BB Gun Defense (they might shoot their eye out)" the doctor told the court that some days I make $110, and some days $700, but I am not a millionaire." When Hymson’s trial was called in Justice Brayton’s court his attorney, L.R. Wharton, asked what the penalty would be in case his client pleaded guilty. The justice replied that the code provided for a maximum fine of $500, or six months in jail. Wharton said that he would not care for a jury trial. The case was then set for trial February 21, but Hymson later decided to settle with the women and accept their offer to refund all money in return for the suit being dropped. A doctor engaging in such unethical practices peaked my curiosity. I have a suspicious mind, so I looked into Dr. J.W. Hymson's past. It revealed some very interesting facts about the good doctor. In 1900, "Jake" Hymson is found living in Louisville, Kentucky as a spectacle peddler. 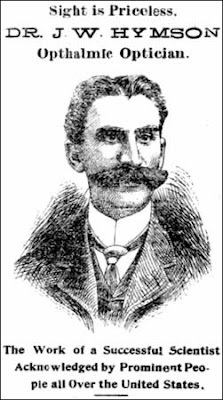 He and his wife Ida and daughter Rebecca immigrated from Russia in 1888. Born in Kentucky are his daughters Rebecca, Mammie, Emma, Estel, and a son Morris. In 1902, just two short years later, Hymson is profiled in the Adair County News, Columbia, Kentucky. The headline reads, " Dr. J.W. 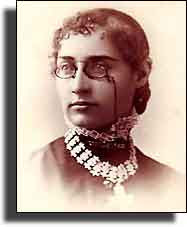 Hymson, opthalmic optician, a successful scientist acknowledged by prominent people all over the United States." The above likeness of Dr. Hymson was included with this article. His possession of his profession is merited by hard work, indisputable skill – and unvarying satisfaction to the thousands of patrons in all the prominent cities of the United States. He stands endorsed by leading medical optical and scientific men of his day, as well as the business men in all walks of life. Difficult work evaded – and often abandoned by other Opticians have been conquered by his superior scientific ability. Sufferers have filled his office eager for advice and to obtain his valuable services. Many who had but one Fluttering Ray of light left in that sight have been saved from blindness, and led by the proper use of Glasses out of darkness and into the light of day again. His exceptional ability, aided by experience and the assistance of all scientific instruments known to his profession make him one of the GREATEST OPTICIANS OF HIS DAY. Many well known people of this vicinity have heard of DR. HYMSON through their friends and welcome his arrival in this city as a long looked for opportunity to consult a man whose ability is seldom equaled, and never surpassed in any age or at any time. Dr. Hymson will be in Columbia this week, until Saturday night at MARCUM HOTEL. How could such a well respected doctor have fallen so far in five years, having to resort to the trickery involved in his arrest in California? Further checking into the Adair County News finds that while the above looks for all intents and purposes as if it is a legitimate news article, it was in fact an advertisement purchased by Dr. J.W. Hymson and most probably written by him. His conduct makes us wonder if Dr. Hymson may have worn out his welcome in Kentucky necessitating the move to California. On 29 May 1905, Dr. J.W. Hymson is listed as having a medical license in California; 18 July 1905, he has a medical license in Plumas County, California; and on 20 August 1907, he receives a medical license in Lake County, California. In his application for a California license, Dr. Hymson lists no school conferring his credentials as an optician. In all fairness, none of the other opticians receiving a medical license in Lake County list a school of graduation. An optician may not have been required to have specific medical education in the early 1900s. 1910 finds Dr. Hymson living in San Francisco owning and operating a general optical clinic. With him are his wife Ida; daughters Rebecca, Marie, Emma, Stella, Rae, and sons Morris, Albert, Hyman. All the daughters except Rebecca and all the sons except Hyman were born in Kentucky, J.W., Ida, and Rebecca are all listed as having been born in Russia. So, it looks as if the Dr. J.W. Hymson living and working in California is in fact our "Jake" Hymson of Kentucky. In 1920, we find Dr. Hymson living with his wife Ida, his daughters Marie, Stella, Rae, Rebecca and her husband Victor Bernstein, and sons Maurice, Albert, and Hyman in San Francisco, California. He is listed as an optician who owns his own establishment. It's good to see that Dr. Hymson is not in jail, be we can only wonder if he is still using scare tactics to sell his spectacles. 1900 U.S. census, Jefferson County, Kentucky, population schedule, Louisville, p. 99, dwelling 15, family 289, Jake Hymson (Head); digital images. Heritage Quest (http://persi.heritagequestonline.com/ : retrieved 20 March 2008); citing NARA microfilm publication T623, roll 530. 1910 U.S. census, San Francisco County, California, population schedule, San Francisco, p. 10, dwelling 173, family 221, Joseph W. Hymson (Head); digital images. Heritage Quest (http://persi.heritagequestonline.com/ : retrieved 20 March 2008); citing NARA microfilm publication T624, roll 99. 1920 U.S. census, San Francisco County, California, population schedule, San Francisco, p. 218, dwelling 82, family 79, Dr. Joseph W. Hymson (Head); digital images. Heritage Quest (http://persi.heritagequestonline.com/ : retrieved 20 March 2008); citing NARA microfilm publication T625, roll 141. Unknown, "Can't Tell What Might Happen - Spectacle Vender(sic) Prophet of Evil," The Los Angeles Herald, 16 February 1907. Online archives. http://www.loc.gov/chroniclingamerica/lccn/sn85042462/1907-02-16/ed-1/seq-4 : 2008. Special To The Herald, "Spectacle Vender Reimburses Victims," The Los Angeles Herald, 17 February 1907. Online archives. http://www.loc.gov/chroniclingamerica/lccn/sn85042462/1907-02-17/ed-1/seq-26 : 2008. Dr. J. W. Hymson, "Dr. J.W. Hymson, opthalmic optician, a successful scientist acknowledged by prominent people all over the United States," The Adair County News, 9 April 1902. Online archives. http://www.loc.gov/chroniclingamerica/lccn/sn86069496/1902-04-09/ed-1/seq-3 : 2008. Bloomingdale's Spectacle Advertisement. ca. 1907. Illustration. Digital image. The Library of Congress, Chronicling America, The evening world (New York, N.Y): May 3, 1907, Final Results Edition, p. 7 - Image 7, http://www.loc.gov/chroniclingamerica/lccn/sn83030193/1907-09-27/ed-1/seq-7 : Retrieved 20 March 2008.
http://www.loc.gov/chroniclingamerica/lccn/sn86069496/1902-04-02/ed-1/seq-3 : Retrieved 20 March 2008. Great sleuthing work tracking down this interesting character. Love your footnotes showing the variety of resources you have used. Oh fM, this is just my cup of tea!You are absolutely brilliant at detective work and writing - what a treat! I think that Groucho Marx could have played the good doctor, with a bigger fake moustache - there is quite a similarity. I wonder if peddling door to door was standard then for opticians? An interesting article.